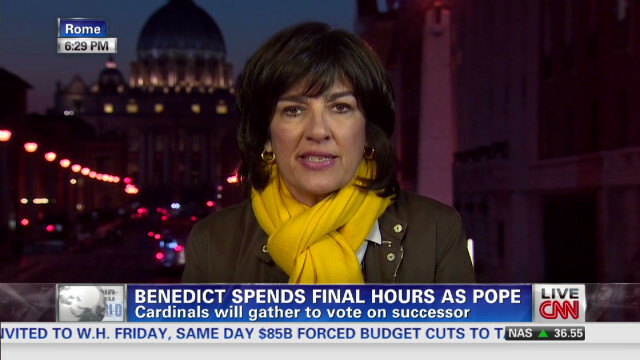 CNN International’s Christiane Amanpour continues to anchor live coverage from Rome all this week – the last week for the papacy of Benedict XVI. On Wednesday’s program, she spoke with Cardinal Theodore McCarrick, former Archbishop of Washington, DC for the Catholic Church and a cardinal participant in the conclave that elected Pope Benedict XVI in 2006. McCarrick today commented on what kind of cardinal is likely to become the next pope, his thoughts about Father Mahony’s recusal from the conclave, and whether he feels the Church is in ‘crisis’ as Pope Benedict XVI resigns on Thursday. On Thursday’s program, Amanpour will have an exclusive interview with Cardinal Timothy Dolan of the North American College of Cardinals. Amanpour airs weekdays on CNN International at 3:00pmET in North America, and at 9:00pmCET in Europe. The full transcript of this program may be found here.